I was having a bit of an off-day when I went to review Le Souk. I was recovering from a horrendous cold, which, in its three day ferocity, had robbed me of the ability to speak for two-thirds of that time, (much to the amusement of friends and colleagues). So when the review loomed, my foggy brain and I went in without really knowing what cuisine it was. I assumed from the “Le”, that it was going to be French- rookie error. I realised, when I stepped inside from Staunton Street that it was in fact, a Middle-Eastern restaurant, and that I actually knew the proprietor, Dody, from my favourite hookah place, Sahara,on Elgin Street. So why the new establishment round the corner in Soho? As far as I could tell from the menu, the dishes served at Le Souk were almost identical to what they serve at Sahara. But, if you’re a frequenter at the latter, you will probably have seen or experienced just how crowded it gets at peak times, and, as tasty as some of the signature dishes are, it’s nigh on impossible to accomodate more than two dishes and your drinks on those incy wincy tables, as well as somehow fitting the hookah in between seats. It’s all a bit claustrophobic. Le Souk, which means ‘the market-place’, has a distinct Middle-Eastern feel to it, with Moroccan hanging lamps and eggplant and Egyptian blue hues adorning the interior. The aim of Le Souk is to be a restaurant first, then a place for hookah, compared to Sahara, which is hookah first, then an eatery. Dody told me that they will eventually be offering shisha after 10.30pm, when the majority of diners have finished their meals. 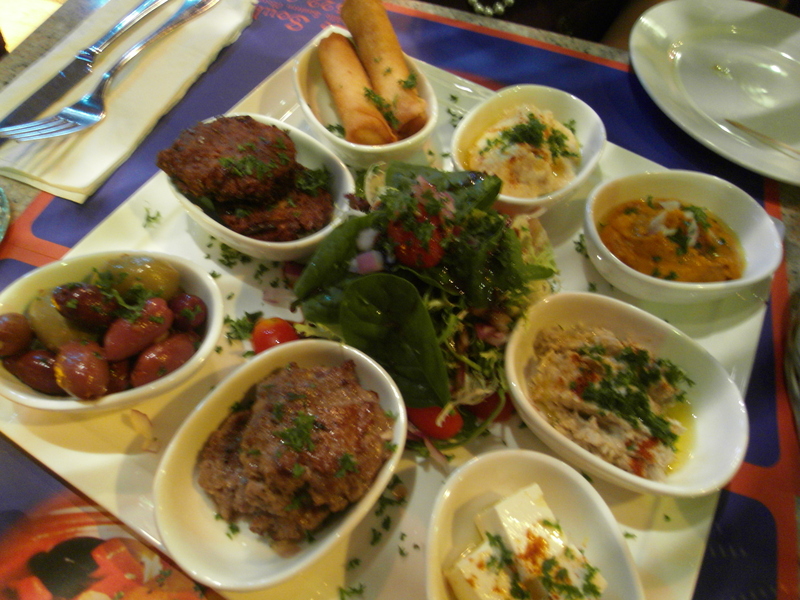 The menu offers a small variety of dishes from Morocco, Egypt and Lebanon. To start, my friend and I had the Moroccan mezze platter. The platter is a good idea for the indecisive, as it has almost everything offered on the appetizer menu. It’s arranged with a flair and comes with a selection of hommos, kefta, babaganoush, zaaluk, falafel, Moroccan cigars, cheese and mixed olives, served with warm pitta bread. It was quite obvious that we found the zaaluk (roasted eggplant pureed with garlic and coriander) unbelievably delish, as the little receptacle it was held in was wiped clean. The babaganoush (smokey roasted eggplant pureed with garlic and tahini) was also excellent. Other standout tidbits were the kefta (grilled minced beef patties) and the Moroccan cigars (filo pastry filled with feta cheese and fresh mint). Be careful that you don’t demolish all the pitta bread with the dips, as you won’t have enough room for mains, which are a generous size. 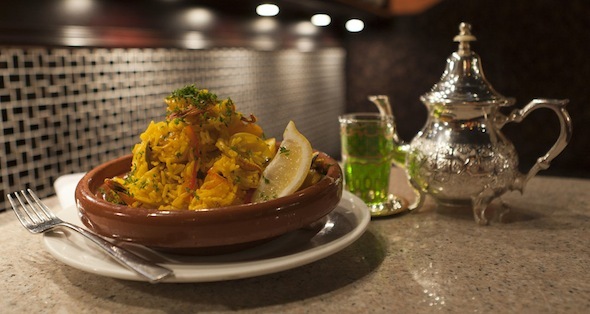 I love the lamb tangine over at Sahara, so we went for that, and also shared the Moroccan seafood paella. 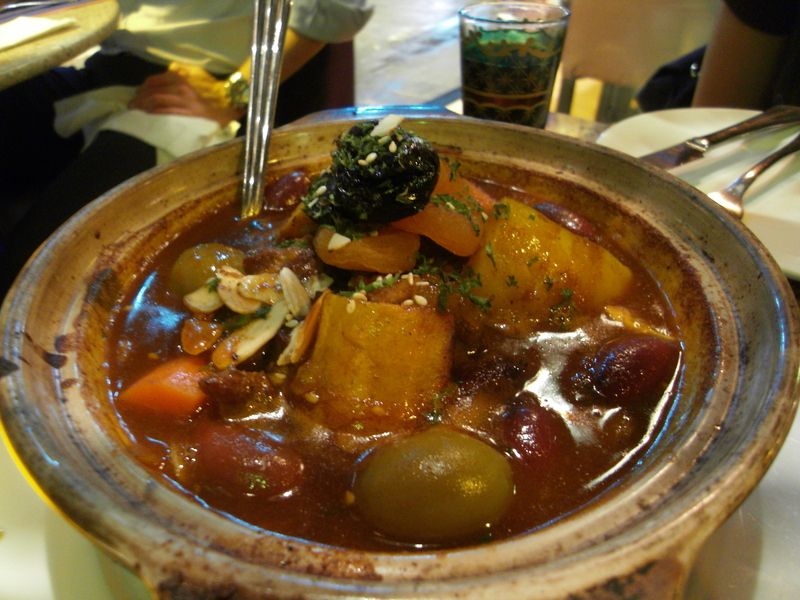 The lamb tangine has always been prepared excellently, so I was pleased that the standard was just as high at Le Souk. The cubes of lamb were beautifully tender and succulent, and the best bit is drenching your couscous with the delectable sweet yet subtly tart gravy, created by the apricots, prunes and preserved lemons the lamb was cooked with. The seafood paella was a lot better than I thought it would be. I generally have a poor opinion of paella dishes I’ve had, outside of the ones I’ve sampled in Spain myself. Previous paellas I’ve had were let down by the soggy consistency of the rice, an overwhelming pile of crustaceans and not enough flavour. I was however, pleasantly surprised by Le Souk’s version. The rice had a nice bite to it, was not too dry and had a good consistency. Like most Morrocan dishes, that distinct lemon flavour was present but not overpowering, (the rice was a happy yellow colour to compliment the taste) and there were plenty of prawns to share with my friend. If you want dessert, you can end with baklava, though I personally always find it a bit tooth-achingly sweet for my tastes. Dody is an excellent host and is fantastic at making sure service is smooth and all customers are satisfied. If Le Souk is anything like Sahara, I would recommend that you stick to their appetisers and lamb and seafood dishes, as they seem to excel in those areas. With more leg and elbow room, I’ll be back for more to enjoy my tangine more comfortably! Le Souk, G/F, 4 Staunton Street, Soho. Tel: 2522 2128. Opening times: 6pm till late. Read the review at Sassy Hong Kong too! 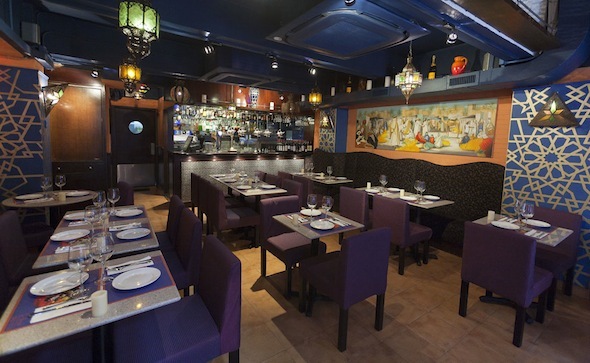 Categories: Middle Eastern | Tags: baklava, Hong Kong, hookah, Le Souk Hong Kong, mezze platter, paella, Sahara Hong Kong, Shisha, Staunton Street, tangine | Permalink.